Aim to reach the South Pole. The party were forced to set up a base at Cape Royds due to poor weather conditions. However, this broke Shackleton’s promise to Scott that he would not winter in this area. They made the first ascent of Mount Erebus, one of the world’s largest active volcanoes. The Aurora Australis was the first book to be written, typeset and published in the Antarctic. They named the Transantarctic Mountains flanking the Ross Ice Shelf, in total they discovered nearly 800km of the range. On his journey towards the South Pole Shackleton realised whilst they had enough supplies to reach their destination but not have enough to cover the return journey. At 88°23’S, just 180km from the South Pole, they turned around. This was the record furthest south for the time. In order to save on coal Nimrod was towed from Lyttleton to the ice edge by Koonya. On 23 January they spotted the Ross Ice Shelf, much of the ice had calved turning the inlet into a wide bay, due to the large number of whales Shackleton named this the Bay of Whales. Shackleton had originally promised Scott this would be where he and his crew would winter, rather than at Hut Point on Ross Island. However, the changing landscape meant it would have been unsafe to set up camp here and Shackleton had to break his promise and head towards Hut Point. The Nimrod followed the coast of Ross Island to Cape Royds 20 miles from Hut Point, Shackleton found an ideal place to camp surrounded by volcanic hills, sheltering the camp from prevailing winds, with sources of freshwater nearby and with Adelie penguins as a source of fresh meat. They unloaded the supplies and built a stable for the ponies and assembled a prefabricated hut. The shore party would consist of 15 men who would spend the winter in the hut. Nimrod then departed arranging to return for the men the following year. On 5 March the western party set out to climb Mount Erebus (3794m), which overlooked the camp on Ross Island. They were the first to have reached the summit, they took photographs and gathered rock specimens from the Mount. Long, steep slopes meant they were able to slide back down. The only casualty of this excursion was Brocklehurst who had to have a toe amputated due to the effects of frostbite. This was the first ascent of one of the world’s largest active volcanoes. Back at the camp four of the ponies had suddenly died. An autopsy on one revealed they had developed a taste for the volcanic sediment; its stomach was filled with sand. This reduced the number of ponies available for the journey south and so from then on the men had to watch them carefully. During the winter the men busied themselves with work: twice-daily meteorological measurements were recorded, and experiments to test the limits of microscopic organisms found in melting ice were undertaken. In addition to this the men wrote, typeset, printed, and bound the first book published in Antarctica – the Aurora Australis. In August Shackleton hauled supplies to Hut Point where he would start his trek to the pole. By mid-October a depot was established at 79°S and the men then returned to the camp. Three sledging parties were planned for the summer, a northern, a western, and a southern. The Northern Party (David, Mawson, Mackay) left the winter quarters on 5 October, where with the help of the car, they laid depots for their return journey. The plan was to head northwards along the coast of Victoria Land hoping to find a passage to the polar plateau and be the first to make it to the magnetic South Pole. On 17 October they planted the British flag taking possession of Victoria Land for the British Empire. Realising that their provisions would not get them to the magnetic pole and back they decided to reduce their rations and supplement their diet with seal meat, in addition they used the seal blubber to make paraffin supplies last longer. They discovered that the Pole was further south than originally thought, however, on 16 January they reached the mean position of the magnetic South Pole. Their journey back was troubled with dwindling food supplies. When they had not returned by 1 February the Nimrod began to look for them, but it was a very large area and they did not know where the party were. Luckily the party heard the boom of Nimrod and emerged from their tent to see it coming into the inlet where they were camped. In their excitement they rushed to the shore, where Mawson disappeared into a crevasse which took him to two feet above the sea. The others were so weakened by their trek they were unable to lift him out and had to wait for help from the Nimrod . A beam was brought ashore and by tying a rope around it Mawson was finally rescued. The Western Party left on 1 December to leave a depot at Butter Point for the return of the Northern party. Once the depot had been deposited they proceeded up the Ferrar Glacier undertaking a geological survey as they went. Just after Christmas they began their retreat to Butter Point where they were due to meet up with the Northern Party and be collected by the Nimrod . However, neither were there and the party were forced to wait and camp on the sea ice, unfortunately the ice had broken away and was drifting toward the open sea. The group spent a day on the ice being buffeted by killer whales, before their ice bumped into the snout of a glacier where they could trek back to the coast of Butter Point. The following morning the Nimrod appeared. On 29 October 1908 the Southern Party set off, led by Shackleton this included Wild, Marshall, and Adams, their aim being to reach the pole. Their supporting party took with them the first car to be taken to the Antarctic, however, the car proved useless on soft snow. The main party were also finding that soft, deep snow was problematic for the ponies, who were meant to be hauling the sledges, and eventually had to result to manhauling. Shackleton cut the party’s rations to make the supplies last longer and as the ponies collapsed they were shot, their meat used for depot laying and their maize added to the men’s rations. Realising they had not brought enough food for the return journey the men’s rations were continually reduced, existing on two biscuits per day in the hope this would stretch their food to make the pole attainable. Christmas day meant they had a little more food than usual, celebrating with a hoosh of pony ration, pemmican, plum pudding, and brandy. On the horizon they could see what were later named the Transantarctic Mountains, flanking the Ross Ice Shelf, in total they discovered nearly 800km of the range. On 18 December they reached the head of the Beardmore Glacier where they had to relay the loads on the sledges. As they increased altitude the men began to suffer the affects of altitude sickness, in addition, the air was so cold that their beards were frozen by their breath. At this point Shackleton became concerned for the fate of his men, he realised that whilst the pole was attainable they would not survive the return, and on 4 January 1909 Shackleton decided they should turn round. They walked a few more miles and on 9 January raised a Union Jack at 88°23’S, just 180km from the South Pole; this was the furthest south at the time. They raced home extremely short of food, reaching the depots was all that mattered, at one point they marched for 14 hours on a cup of tea, two biscuits, and two spoonfuls of cheese. Eight days after turning round they reached the Ross Ice Shelf where they had stored a depot of pony meat to last 6 days. This meat had become contaminated and the party developed dysentery, resulting in a much slower pace. They continued on to their various depots, at one finding some frozen blood from one of the ponies, this became a welcome addition to their ration. They continued marching, sighting Mount Erebus and reaching a further two depots, however, the health of the party was poor and on 27 February Marshall collapsed with severe dysentery. Shackleton left him with Adams, whilst he and Wild struck out for Hut Point where they hoped help could be reached. Shackleton had ordered the Nimrod to leave on 1 March. They made it to the hut to find plenty of supplies and a note saying the ship would wait in the area until 26 February, it was now the 28 February, they had missed Nimrod by two days. In the morning they set fire to the magnetic observation hut, hoping the Nimrod would be close enough to see the flames. 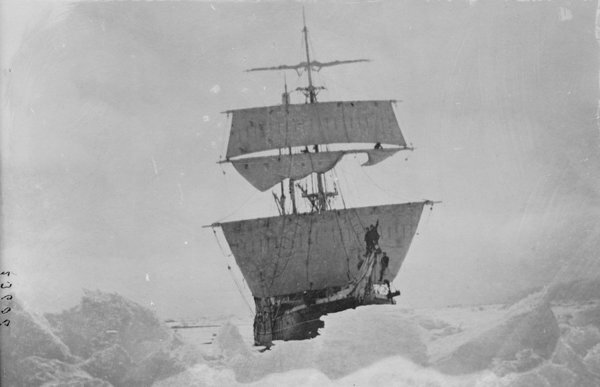 The ship had been returning with a search party and spotted the fire, Shackleton and Wild were on board by mid-morning. Shackleton was then able to guide a rescue party to Marshall and Adams. Once on board, Shackleton was reunited with the other sledging parties and base camp members he had not seen since his departure. By 4 March 1909 all were on board and on their way to New Zealand. Shackleton, E. (1909) The Heart of the Antarctic: the Furthest South Expedition 1907-09. Reprinted, London:Pimlico 1999. Riffenburgh, B. (2005) Shackletons forgotten expedition: The voyage of the Nimrod. Bloomsbury. This entry was posted on Wednesday, November 5th, 2008 at 4:58 pm	and is filed under British Antarctic Expedition 1907-09. You can follow any responses to this entry through the RSS 2.0 feed. Both comments and pings are currently closed.